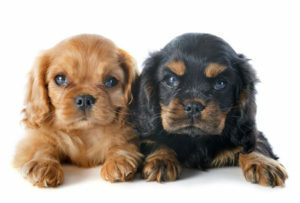 The Cavalier King Charles Spaniel is one of the largest toy breeds. The breed is highly affectionate, playful, extremely patient and eager to please. As such, dogs of the breed are good with children and other dogs. They will adapt quickly to almost any environment, family, and location and suit city and country life. Their ability to bond with larger and smaller dogs makes them ideal in houses with more than one breed of dog. This comfort-loving breed adores cuddling in laps and snuggling on soft pillows, but he also can keep up with a wide range of activities. Kings choice.